Well, although it did not get much screen time I think we can agree it's a pretty cool looking helmet. Sharing alot of similarities with the ShoreTrooper (minus the re-purposed Scout Biker re-breathers..) the sweeping lines on the jowls make it an intimidating helmet. Although it is hard to see, in some shots I have seen what appears to be a grid like pattern on the cheek inserts. Bith have been included here. If you want the grid pattern, print 4A grid and 7A grid. If you Don't want the grid pattern, simply print parts 4 and 7 - or print both and decide when you put it together! All pieces are cut flat on multiple sides for options for printing orientation. They are at 0,0,0 on the build plate and repaired using a professional grade mesh repairing tool to ensure you don't have ANY slicing issues at all. If you do ever has a problem please contact us, we will sort it out ASAP! We have seen our competitors selling this helmet at an outrageous price. By supporting us you are helping us reduce the cost of future designs. Without shame - we want people printing our stuff! it's as simple as that. That's what we get a kick out of. Good luck printing, and as always, may the Schwartz be with you. I've printed out the entire helmet and it looks awesome. Just need to move onto Bondo to fill in the cracks. I feel like it's kind of big, and I'm 5' 11", but I won't really know until I have at least the chest piece to go with it to bulk up the rest of me. I wanna buy this and check it out but I would like to see the wireframe mesh of the model first. What program did you use to make this model Geoffro? A very good representation of the screen used prop. The skin of the helmet is a bit thin, and the shield doesn't fit in the notch on the front of the crown properly. If you want to wear this helmet, the brim at the bottom is a bit narrow to fit your head in, if you're an adult, but a child's head will fit in nicely. 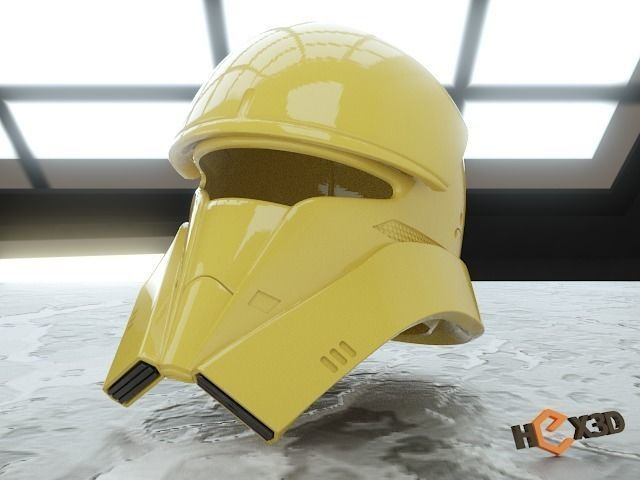 The frown will have to be modified to look a bit more mean, but this helmet is the best 3D printable one available at this time.